Mike Howell (Jesse Eisenberg) is a small-town guy, stuck in a dead end job at the local convenience store. He spends his spare time smoking dope and doodling ideas for a comic book featuring a space travelling super monkey called Apollo Ape. Luckily, he’s in a long term relationship with Phoebe (Kristen Stewart), who seems to be his perfect soulmate and who tolerates the fact that Mike has crippling anxiety attacks whenever he tries to travel. Most recently, a long-desired vacation to Hawaii is nixed, when he finds himself running to the john to vomit. As is so often the case in movies like this, all is not what it seems and circumstances conspire to reveal that Mike is in fact, a brainwashed undercover CIA operative, who has been waiting for a certain sequence of words to reactivate him. Eisenberg is, as ever, a likeable screen presence and Kristen Stewart was always a better actress than the execrable Twilight series allowed her to demonstrate. The first third of this movie is great fun, as Mike realises that he has the potential to be a highly skilled assassin – but once those talents are acquired, the film loses some of its appeal as it becomes a series of ever more complicated Heath Robinsonesque murders. All manner of gadgets are utilised in Mike’s struggle for survival – mallets, screwdrivers, frying pans and claw hammers – you get the impression that here’s yet another film that must have been sponsored by B & Q. The action is unflinchingly bloody, but shot with enough cartoonish relish to just about excuse its most brutal excesses. Topher Grace and Connie Britton as two warring CIA honchos add depth to Max Landis’s script and there’s an appealing cameo from Bill Pullman as their ruthless boss, but the conviction remains that this could have been better if it had managed to maintain the more appealing elements on show in the first half hour. 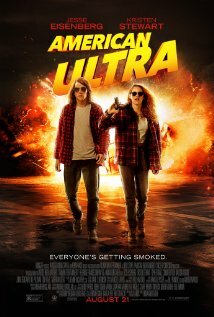 American Ultra is eminently watchable, but could easily have been something more than that.